A SERIES of major earthquakes have struck central California with residents in the city of Hollister reporting being shaken awake by the tremors. Magnitude 3.0 to 4.1. Near Hollister, the self described earthquake capitol of the world. Seriously. This is barely a local news story in this part of the world. 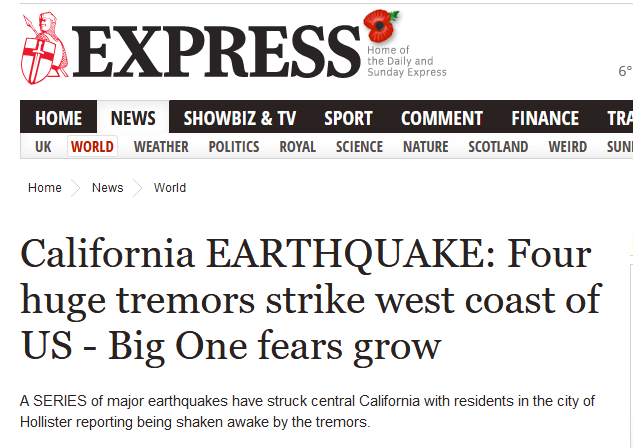 But read that creative headline “California EARTHQUAKE: Four huge tremors strike west coast of US – Big One fears grow”. Good grief. That is fake news, well beyond the creative and fictional news categories.